I’ve been looking forward to visiting Satollo in Marlow ever since I first heard about it a few weeks ago. After taking a chance at the deli counter in Sainsbury’s last week, only to be sorely (and foolishly) disappointed on so many levels, I drove into Marlow last Wednesday with the hope and desperation of a gourmand in despair. Tucked away in Liston Court, just off the High St in Marlow is where Satollo, and my salvation, awaits. The name is odd, but meaningful (satollo means “satiated” in Italian) and the range is modest but of the most excellent quality. The large windows and dangling joints of cured meats invite the hungry passer-by, and inside the light and airy space you’ll find a mixture of reclaimed and hand-made decor. It’s no surprise to find out that the Sardinian owners, Luca and Allesandra Cesaroni are designers by trade and in spirit. Former graphic designer /DJ/producer Luca met optician Alessandra in London and moved to Cookham 4 years ago (read more about the dynamic duo here). They have long dreamed of creating an authentic Italian eating experience and I’m pleased to report that they have succeeded. Satollo is the jewel of Marlow. Offering selected wines, prosecco, limoncello, grappa and a big variety of Italian cheeses, cured meats, olives and other antipasti, Satollo make fresh gourmet focaccia and ciabatta to eat in or takeaway. 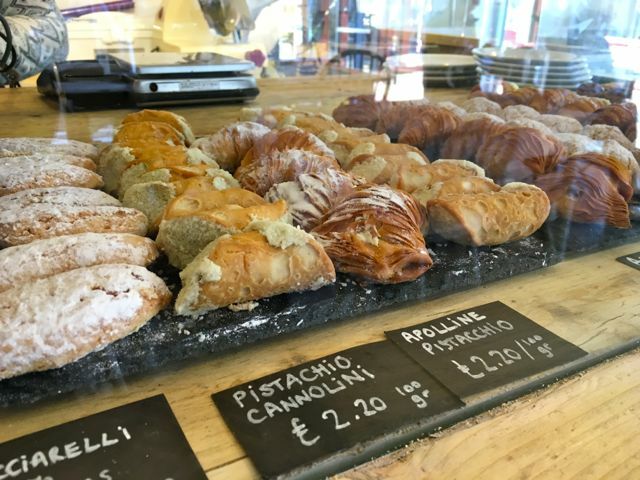 Sourcing their coffee from Naples and their incredible bread from Rex Bakery in Little Chalfont, your visit to Satollo will delight, whether you’re stopping by for a quick coffee or a lingering on a gourmet lunch. Luca kindly made me up a mixed cheese and meat board – but on the menu you’ll have to choose from either meat or cheese. 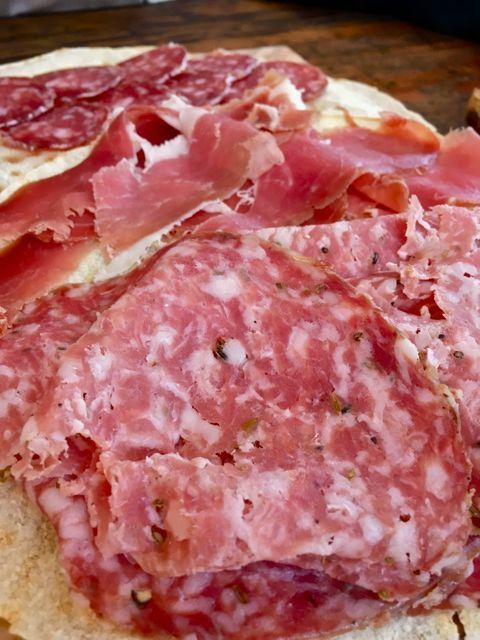 We were treated to wafer thin slices (take note Sainsbury’s) of Tuscan prosciutto, fennel-infused Finocchiona and Felino salami on crisp sheets of Sardinian flat bread. The smell was heavenly. The taste – even more divine. 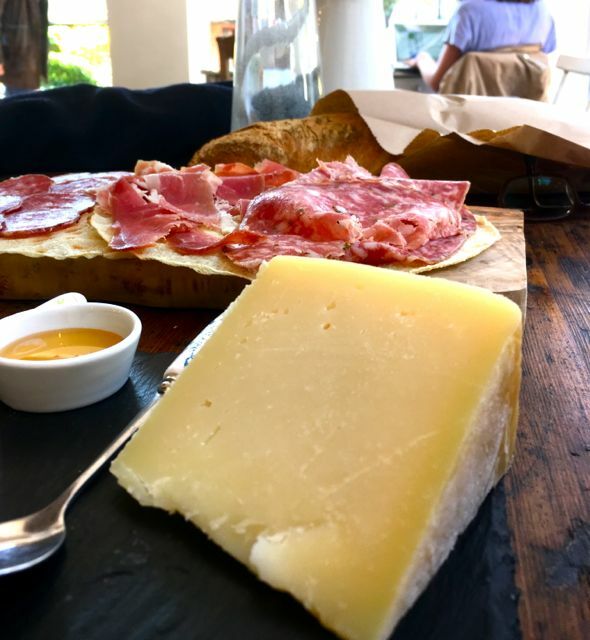 We also enjoyed chunks of Taleggio and Tuscan Pecorino on a board served with honey and Satollo’s own brand of chutney, a tart little dollop made with prune, radicchio and Teroldego wine; these accoutrements lifting the flavours of the cheese to new and glorious heights. While my greedy gaze wanted thick slabs of ciabatta served with my gourmet antipasti, the flat bread was actually a superior choice, because it allowed the flavours of the meats and cheeses to be fully appreciated and I wasn’t left feeling stuffed, but rather pleasantly satiated. Open 7 days a week, serving up traditional Italian breakfasts along with a chic Italian lunch selection, Satollo is a destination deli for lovers of authentic Italian fare and the ambience and style of an independent eatery. I only wish they had opened in Cookham. Opening hours are: 9am to 5:30pm (Monday–Thursday), 9am–9pm (Friday–Saturday) and 10am–5pm (Sunday).